An attractive small weeping tree, the Weeping Spring Tree (Prunus pendula 'Pendula Rubra') is a real focal point in the garden in March and April, before its leaves emerge by its particularly pretty, single, deep-rosy pink flowers that smoother its long sweeping branches. Expect a height of 2m (7ft) and spread of 2m (7ft), so an ideal choice for a small garden. As with most weeping trees, you can determine final height by allowing the tree to grow to the height you require and then cut the main trunk/stem. If you are going to restrict growth by keeping it in the pot and then planting it, you need to remember to feed every year. The larger the pot, the larger the tree will grow. This tree is supplied at of height of between 1.5m and 2.4m and in a 12-25L container, which means that the tree can be planted any time of the year and with better results than either bare-root or rootballed trees. 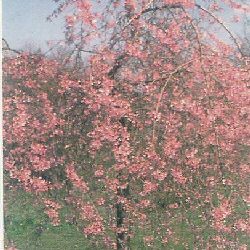 If you require more than one tree then discounts are offered at the Cherry Trees in Volume section.